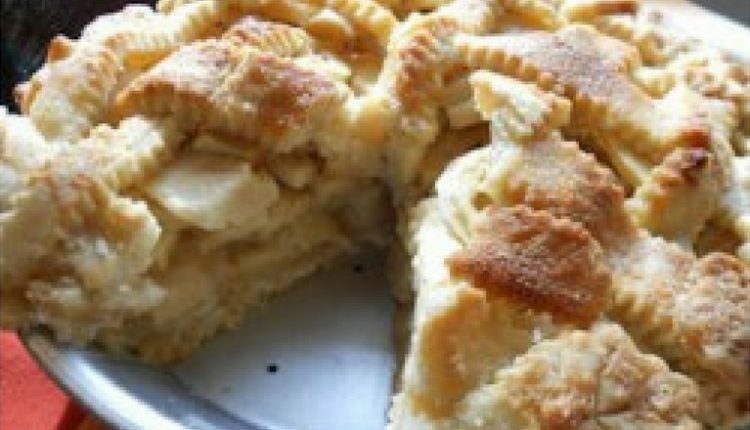 What Could Be More American than Apple Pie! I grew up living near a place called Apple Hill. There were farms that had been in families for generations. You could get fresh pressed cider, caramel dipped apples, apple pies and tons of other apple or pear inspired goodies. Plus, there were bins upon bins of a huge variety of apples. When I was a teenager I was able to get a job at one of the orchards. I served a lot of pie. Every Sunday night before we would head for home my parents would buy a big box of apples for us to eat during the week. I learned early on that apples were amazing fruit to eat and cook with and would go through the Apple Hill cookbook, trying new recipes. For the longest time, I stuck to the Apple muffins and cake. My mom was the best pie maker in the family. Her crusts were always perfect so I never tried my hand at pie baking. I felt like anything I made would be only a second-class dessert so just stuck with what I felt comfortable with. A few years ago, I had a bunch of apples and for some reason the thought of those perfect pies just stuck in my head. I lived miles and miles from Apple Hill, but the thought of the perfect wedges caused me to rethink my apprehension of crust making. So, I did it! I looked up a perfect recipe, followed it, and BAM! The best pie ever came out of my oven, and let me tell you, if I can make a perfect pie, you can too! This is what All Recipes.com has to say about this recipe. Quick Tip: Use good crisp baking apples like a Granny Smith, Arkansas Black, Honey Crisp.